Who the Son sets free is free indeed…right? I think that is awesome! The New Year does bring new hope, and a new level of excitement. Personally my goals are very intentional this year. I am trying to get healthy physically, again…no injuries this time. I am wanting to stay off social media A LOT more than I do. I want more family, more God, more time, more health and intentionality with my emotions and less screen time, less belly, and definitely less distractions from what really matters. So as we start this journey into the year 2019 I want you to know that we are rooting for you, and we hope this will be the best year it can be for you and your family. So with the start of the New Year, we are starting a brand new series that I could not be more excited about because we are going to be diving into some really important concepts that can literally lead you to freedom and victory in your spiritual life, which we have been learning ties directly into your practical life right? All of it ties together. So you can have freedom and victory in your life as you begin to live out the words of Scripture and put into play the concepts that we will be diving into over the next few weeks and months. This is such a big deal to us here at MRC, that this becomes more than just some Sunday morning fuzzy ideas, but that it moves into who you are. I mean, freedom and victory sounds nice doesn’t it? Well it should be our reality as Christians. This isn’t something a Pastor sells to fill seats in the church and get us to do the church thing. This is what we should be experiencing as followers of Jesus! Check this out, I’m not making this up, here are just a few examples right out of our Scriptures about this freedom and victory we should be walking in. As Christians we should be experiencing freedom! We should be living victorious lives as believers in Jesus! And so as we invite Jesus into our lives and surrender our will to His, allowing the Holy Spirit to lead our lives, this SHOULD be our experience as Christians…but for so many of us, I don’t think we would describe our lives as free and victorious. If we are being honest, life is hard and we continue to struggle. It’s almost like there is something out there, taking from us, weakening us, keeping us “stuck” not allowing us to stand tall in the freedom that we SHOULD be experiencing in our lives now that Jesus is in it! Well maybe that is where we need to start today. So what exactly is kryptonite? Well kryptonite is the substance that weakens Superman. So we just left the Bible, and reality and headed to the movies and comic book word…I know! Stay with me! I’m pretty sure we have all at least heard of Superman haven’t we? You know the superhero who always saves the day right? He is faster than a speeding bullet, more powerful than a locomotive…it’s a bird, it’s a plane, no it’s Superman!” Blue tights, red cape, the “S” on his chest…yeah that guy. Well Superman was unstoppable, there was nothing you could do to defeat him, except use this one thing. There was this thing that could weaken him. That thing was kryptonite. In the movies or comic books it looks like a green rock, that apparently came from his home planet that could drain him and keep him from being the person he was destined to be. Kryptonite could keep Superman from walking in the freedom and victory and power that he should be walking in, and quite frankly that relates to you and I and our spiritual lives in a big time way. So just like Superman we are to stand in who we were destined to be. Just like Superman we are to be living with freedom, and victory. While Superman has super power, we are to live with the kind of God power that Paul just told us about there. And just like Superman we have to deal with this “thing” that takes, distracts, and weakens, us. We have this “thing” that just doesn’t allow us to stand fully as the people God destined us to be. We have our own spiritual kryptonite, and that spiritual kryptonite is sin. I think if there was one difference between Superman’s kryptonite and our “spiritual kryptonite” it is that Superman is afraid of his weakness and tries his best to avoid or keep his distance from it, but for us humans our spiritual kryptonite is often very tempting and often pulling us in with fun and pleasure, so instead of avoiding it and keeping our distance, it often pulls us in…so we have to be really intentional and focused because sin isn’t a scary, glowing green rock from Krypton that we obviously want to avoid but it’s just as dangerous if not more. And while it often hides itself in excitement and fun, making us feel good in the moment, make no mistake about it, in the end it’s dangerous, it’s deadly. Scripture is clear, it leads to death. Sin is the very thing that weakens us. It is sin that destroys our closeness to God. It is sin that doesn’t allow us to stand in our true identity, and if we aren’t careful it is sin that keeps us from being the people that God destined us to be, literally making someone who Jesus has set free a slave smothering out all that should be. So sin is our spiritual kryptonite and it comes in all kinds of different shapes and sizes. So what exactly is sin? Well it is any thought or action that falls short of God’s will. Remember God is perfect, and anything we do that falls short of His perfection is sin. So when we sin, we are falling short of God’s will for our lives and we need to remember something because people get a little uncomfortable these days with talks on holiness and sin…we need to remember that sin is something that we all deal with…each and everyone one of us. This is why we need Jesus so badly in our lives! We need Jesus because we all have a problem with our spiritual kryptonite. I really don’t like bringing up sin without reminding you of something Paul said in Romans that should calm us down and keep all of us from judging others. That is so important for you to remember, that we ALL have sinned, we ALL deal with this spiritual kryptonite. You aren’t alone in dealing with sin, we ALL fall short of God’s glorious standard for our lives, which is why we are so grateful for Jesus. So I know it is the first Sunday of the year and I’m throwing a lot at you but as we kick off this new series I really wanted to show you this spiritual kryptonite that we all deal with is sin. I wanted you to understand this as we get started in this series. I have been using this wording of victory and freedom when it comes to our lives very intentionally. I wanted to reveal to you this idea of who we SHOULD be as Disciples of Christ…FREE, and VICTORIOUS! I also wanted to reveal to you the reason so many of us struggle to find that freedom and victory…I didn’t want you going this whole series wondering what this spiritual kryptonite is! Our spiritual kryptonite is sin. I want you to see it, and know what it is because as we understand this, I believe it allows us to deal with it, which is what will happen all series long. I also want to take you to Jesus’ words today in John 8. As I started preparing this message I couldn’t get these words out of my head and frankly this language of freedom through Jesus comes from here, and also the idea of our spiritual kryptonite enslaving us comes right from here as well. So here’s what Jesus says in the three verses we will really study today. It’s a very intense moment and now Jesus goes back to teaching and as he speaks he gives us this incredible statement about sin tying it to slavery, and how the Son (He is talking about Himself) sets us free, and whoever is free is truly free. This is beautiful and I would really like to take these three sentences and dive into them a little deeper today! Sin (Our Spiritual Kryptonite) enslaves us. So I’m assuming that this sin and freedom talk is happening because just a few moments ago the church leaders of the time just dragged a woman into the temple to kill her. I doubt that has slipped anyone in the crowds memories a minute or two later. I am thinking that it will take a little while to shake that one off am I right? And Jesus makes a really intense statement about sin here. I was even thinking about God’s warning to Cain all the way back in Genesis before he kills his brother Abel. Some of you probably just read this as you do the ‘read your Bible in a year challenge’ in 2019. I wanted you to see this warning about sin enslaving us…we have to watch out for our Spiritual Kryptonite. Now it’s what Jesus says next that really is so awesome and so redemptive. Jesus sets us free from sin. This is what it’s all about. This is why we celebrate and worship Jesus because He is the answer to free us from the bonds of slavery in sin. I could spend all day talking about and walking you through scripture about Jesus setting us free. I know this talk of freedom and victory compared to slavery to sin is pretty intense but I want you to understand this imagery because this is literally how we live our lives. We just spent an entire series talking about walking in the Spirit and how we choose to live for God or for ourselves. That is our reality. Are we inviting the Holy Spirit into our lives? Because where the Spirit of the Lord is, there is freedom! If we continue to live for ourselves we will not experience life as God intended, a life that we can have with freedom, joy, strength, and victory. For so many of us we hear the kind of life we should live and can have as followers of Jesus but it just isn’t our experience. We read about it in Scripture and we want it, but if we are honest we are not living in the amazing and empowering freedom that we should be living in, and I think we need to understand that just like Superman, we are dealing with Spiritual Kryptonite that is designed to take, weaken, and distract so we don’t experience what we would say is the true freedom and victory that should be experienced in the life of a Christian. You know as I was putting this talk together I was looking at different imagery of what sin is and this really was interesting. Sin is described in the Bibles earliest days as “missing the mark.” So sin is like an archer who misses the target. He draws back his bow and sends the arrow on its way—but instead of hitting the bull’s-eye, it veers off course and misses the mark. The arrow may only miss it a little bit or it may miss it a great deal—but the result is the same: The arrow doesn’t land where it is supposed to. The same is true of sin. God’s will is like the center of that target—and when we sin, we fall short of His will, we miss the mark. I really like this imagery and think we should personalize this. We have been created by God intentionally to stand in our purpose and be the person He created us to be and when we fall enslaved to sin, we fall short…we miss the mark on all we could be. Maybe that is a great way for you and I to understand why we keep hearing about this awesome life we should have but we just can’t seem to find, or experience. We want it. We like the idea of victory and freedom and strength, but we just keep missing the mark. We need to be aware of our spiritual kryptonite which doesn’t allow us to stand as the people God created us to be and we need to invite Jesus into our lives because He frees us from the kryptonite, it’s Jesus who directs us back on course and keeps us from missing out on all that could be in our lives! I love that imagery. If God’s design for my life is the bullseye, it’s this spiritual kryptonite that keeps me from hitting the mark on who I should be in my life. So the question of the day and of this series becomes this. 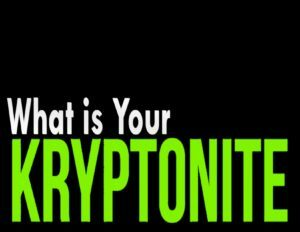 “What is your kryptonite?” What is keeping your from hitting the mark? What is keeping you from living the kind of life that Jesus came to provide? This is what we are diving into, and what we are going to work through all the way up to Easter this year, and I can’t wait! So this is what normal should be as a Christian. Take time this week, think through this list, read the scripture behind each question, and know that if you are missing the mark on this, it’s ok…we all fall short. Maybe it’s time to identify our spiritual kryptonite, and really allow Jesus to bring the kind of victory and freedom we all desire, so that our lives hit this mark of what normal Christianity can be. So think this through, we all deal with sin. No one wants to be a slave to this spiritual kryptonite. Everyone wants freedom and victory and through Jesus we can have it. This entry was posted in Holiness, Identity, Jesus, Sin. Bookmark the permalink.